Master key systems are the standard lock system of choice for large commercial or industrial buildings, office complexes, and multi-unit residential communities. In an apartment building, for example, all of the tenants have access to the lock in the front door. In some cases, the same key also opens the apartment unit door. Why can’t everyone access that apartment? It’s because in a Master Key system, the locks are configured to work with certain keys but not with others. The same would be true in office building. A tenant may have access to one office suite with a key that looks very similar to the janitor’s key, which opens some of the doors but not all of them. The property manager’s key is the master key that opens all of the doors. 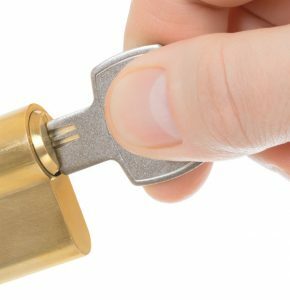 The benefit of a Master Key system is that it allows a minimal amount of rekeying of locks when a tenant leaves or the janitor is no longer employed. As in any keyed lockset system, quality matters. Manually opening doors with a key subjects the internal mechanism of that handset to wear and tear – especially when it is a “store room” or “classroom” function lock that can only be opened with a key. When purchasing a commercial door handset, spend a few extra bucks to get a quality one. At Goffstown Lock and Key, we install the professional models of all of the major brands for our clients. Are you a realtor, property manager, or condominium association board member in charge of keys? Call us today at (603) 647-2107! We would love to talk to you about your options to keep your buildings safe and secure.